We are excited to announce a new program, Integrator Insights, that will gather and share integrator beliefs and concerns on video surveillance. Every quarter, we will conduct a survey of integrators around the world, aggregating and analyzing the results into an IPVM report. This post explains the program. Our goal is to understand what integrators are looking for and what problems they are facing. With this information, we can help educate and advocate for improvements. Any integrator can participate. All they need to do is full out a 30 question survey that takes about 20 minutes to complete. The survey will be sent out this Wednesday October 26th. Every integrator who answers the survey will be paid $20 (via paypal). Include your paypal email address when answering the survey and $20 will be sent to you by the next day. We are limiting this to 75 total integrator responses. The results will be published anonymously and no integrator's identity will be publicly disclosed. More than 40 integrators have already signed up from the preliminary discussion in our Member's group. Integrators who are interested can register here for the survey. What is the average number of cameras you deploy per site? Among all cameras, do you deploy more analog or IP cameras? Among IP cameras, do you deploy more SD or MP cameras? Among MP cameras, how often do you deploy multi-megapixel cameras? Do you offer / resell VSaaS? How often do you deploy video analytics? 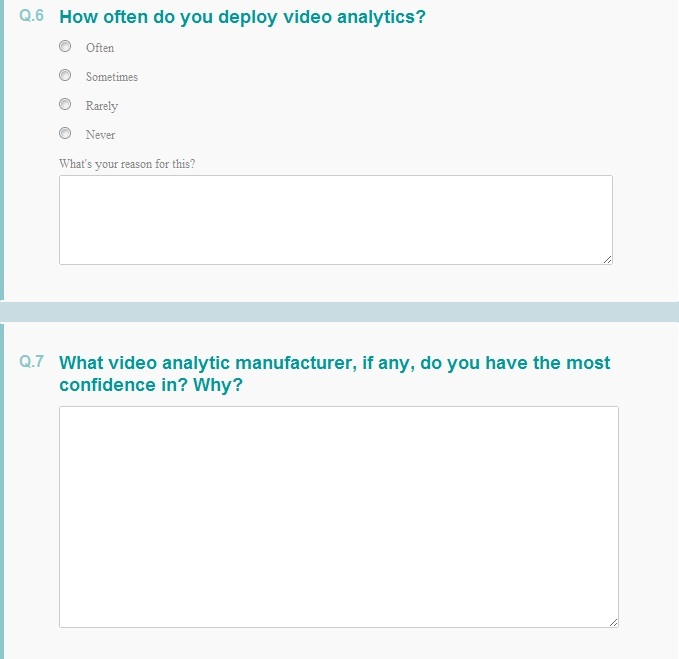 What video analytics, if any, do you have most confidence in? How often do you deploy PSIM? Do you deploy more VMS software on COTS harware or NVR/DVR appliances? For VMS systems, do you prefer client based or browser based software? What type of network setup do you most often use? Reuse customer's network or setup new network for cameras? For recording, do you normally use motion or continuous based recording? What is the average frame rate you record at? How important is auto back focus / auto focusing capabilities? What type of lens do you most commonly use? Fixed focal or Varifocal? What is your favorite VMS system? What VMS system have you had the worst experience with? What is your favorite IP camera manufacturer? What IP camera manufacturer have you had the worst experience with? How often do you use IR lighting for outdoor cameras? Do you use cameras with integrated IR lighting? What is your favorite wireless system to use with video surveillance? Compared to 3 years ago, how often are you deploying PTZs? As with all IPVM efforts, there will be no sponsorships no advertising from manufacturers. Industry insiders are likely aware that many surveys in the industry are sponsored by manufacturers to ask questions in ways that benefit manufacturers or try to elicit positive answers for sponsoring manufacturers. Every quarter, we will release the full results to all IP Video PRO Members and participants. No personal information from the participants will be shared. We will report the percentages for each question, share comments from the integrators and provide our analysis of the significant and impact of each reponse. Each quarter, we will prepare new survey questions based on feedback from the participants and the community. If you are an integrator who wants to participate and have not already recorded your interest in our earlier LinkedIn discussion, leave a comment. If you have any questions about the program, please ask in the comments.